Lester Vivian was born in 1932 in Gander Bay, Newfoundland. By the age of sixteen, he had learned how to build Gander Bay boats and began to work on the Gander River. “The river was our highway,” Lester says, and served as the primary route between Gander Bay and Glenwood until the Trans-Canada Highway was completed in 1962. “It would take two days to get to Glenwood before motors,” says Lester about his father’s generation. 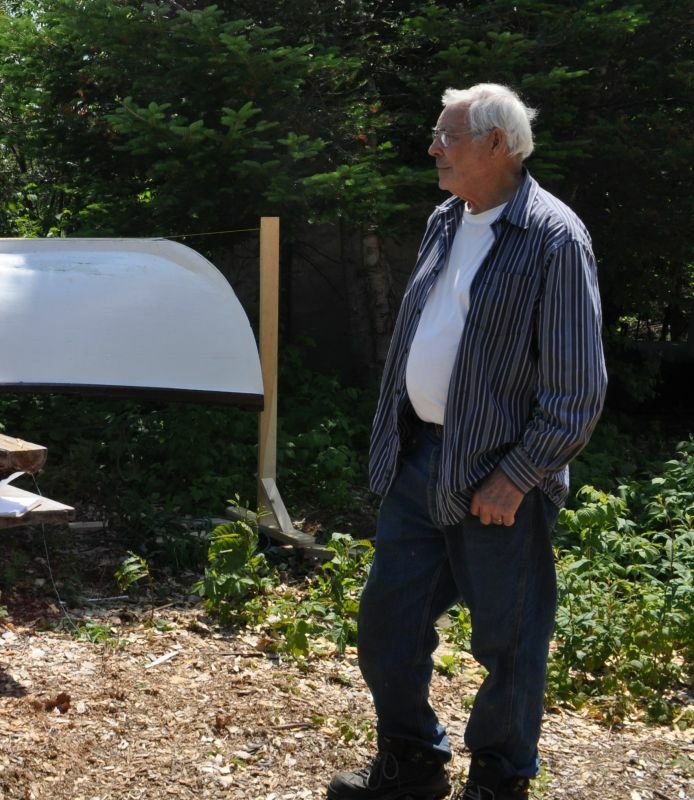 Without a motor, rivermen used paddles, a pole, and a sail on the centre beam, “if the wind was right.” Lester’s father got his first motor in the 1940s – a 3.3 horsepower Evinrude. Lester’s first boat was constructed without power tools. Without electricity in Gander Bay until 1967, “all the work was done by hand,” Lester recalls. The wood would be cut into slabs by the saw mill, and then each slab had to be sawn by hand into laths for the ribs – a process that would take four to five days. Lester spent twenty-two years as a river guide for an outfitter camp in Labrador owned by Abitibi Price pulp and paper company. Located on Hunt River, between Hopedale and Natuashish, the camp was reached by a Twin Otter aircraft and was used exclusively by clients and guests of Abitibi-Price. Lester also worked as a guide on the Gander River for Abitibi Price and for the Government Camp. In total, Lester has spent more than fifty years as a river guide in Newfoundland and Labrador. Lester’s clients were mostly businessmen and government officials, people from all over the world including Spain, France, Russia and Mexico. “More than once we had to fetch the hook from trees,” Lester laughs. During his time as a guide, Lester had the opportunity to meet a number of notable people including George Bush Sr., General Wes Marlon, General and movie star Mark Clark, and legendary fisherman Lee Wulff, who is said to have fished every river in Labrador and was described by Lester as a “skilled fisherman and a fine man”.